This past summer while visiting the Hearst Castle in California, the love of my life asked me to marry him. It was perfect and better then I ever could have imagined. We both love traveling so we knew right away that we wanted to do a destination wedding. We wanted everything to be in a package so we chose a cruise to the Bahamas. We also want to celebrate with our family and friends when we get back to Indiana so we will have a reception at the Blanton House in Danville. The Georgian Colonial Style mansion is perfect for us as it is surrounded by woods, has a large tent just outside its door and can hold up to 250 seated guests. I have learned a lot going through the planning stages and I talked to my friend Melissa, who is also engaged, to come up with ten tips that every bride-to-be in Central Indiana should know. 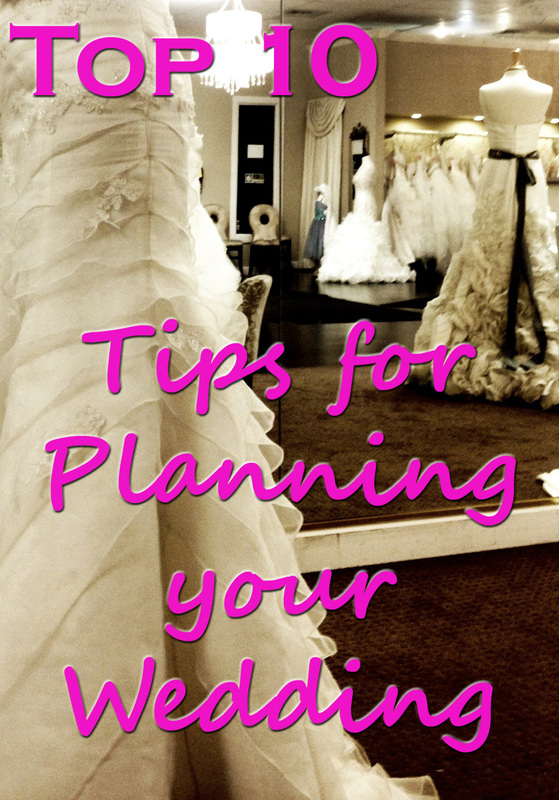 If you’re planning your wedding now or soon will be these wedding planning tips will help. Set a budget. This is one of the first things you need to do. Weddings can get very expensive so finding a realistic number you can afford is very important. If your parents are paying for it or helping with the costs, it is important to know what their amount will be. No one wants to start their new life together in debt. Watch out for hidden costs. You will be surprised by how many things cost extra. Venues can charge a rental fee for anything and everything from cake serving, to stair rental for the bridal party to get to a stage for the ceremony (who knew). Bakeries may charge a mileage fee on top of a delivery charge. Wedding gown prices do not stop with just buying the dress; you may also need to consider fees for alterations, professional pressing or steaming and any other accessories to complete the look of your dress including the veil and undergarments. Determine what’s most important to you. This varies from couple to couple and can be anything from the location, to photography, to food, to a specific date and more. If you know ahead of time what is important to both of you, then it will help you determine what aspect of your wedding you need to have handled first and it will be easier to find out where you can cut costs. Find your location as soon as you can. It’s amazing how far out some locations need to be booked. Also, if you’re looking for a way to save money on a venue, be flexible about what day you want to have your wedding and reception. Several places give price breaks for Friday or Sunday weddings or off-peak months. Check out Bridal Shows. You get to talk to professionals that can help, sample products, and get great ideas for your wedding. Two upcoming shows in Hendricks County that I would recommend are The Brides to Be Expo from 10 a.m.-2 p.m., Feb. 16 at Five Star Catering at Primo West in Plainfield, Indiana, and the Hendricks County ICON Bridal Show from 3-6 p.m., March 3, 2013, at the Crown Room in Brownsburg, Indiana. Save money on decorations. Decorating your wedding and reception can get expensive. Some locations may have basic decorations/centerpieces that you can use. If not, there are businesses in the area, like Gallery 52, that allow you to rent centerpieces at a small portion of the price that you would actually pay for the centerpieces. Plan your bridal gown appointment on a weekday. Weekends tend to be much busier and a little more overwhelming. Try to limit yourself to two stores a day. Otherwise you may become confused and forget what you have seen or tried on. Get Online. I can’t tell you how many of my married friends have stated that they wish Pinterest was around when they were getting married. Pinterest is a social media site that gives you tons of ideas for your bridal shower, wedding and reception. I’ve found TheKnot.com to also be a great resource. It is full of wedding planning tools and gives you the ability to do things like make a website; it has forums to answer questions and it has a great checklist. Ask for help. 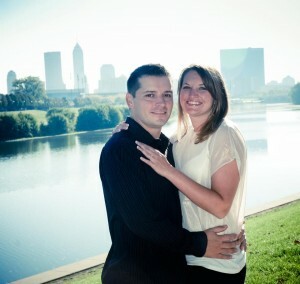 If you want a full wedding planner there are tons of people to turn to in the area. 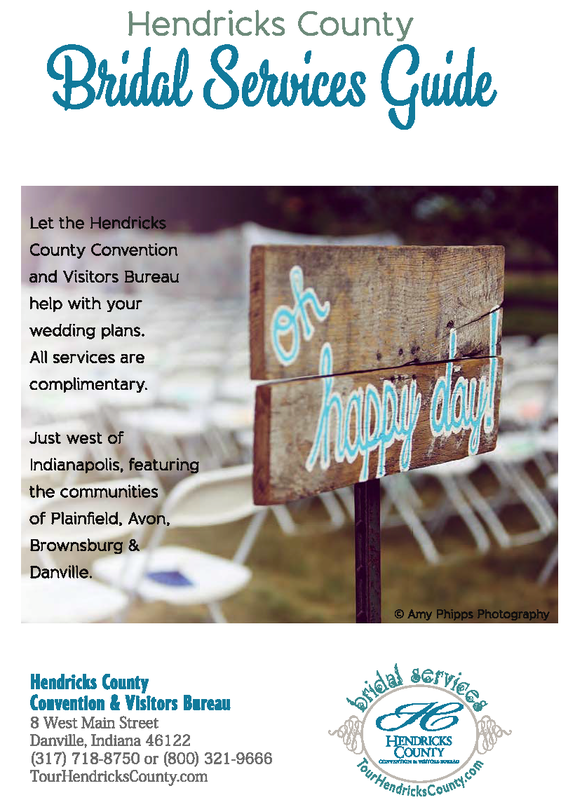 I have been asking for a lot of help from some of my co-workers here at the Hendricks County Convention and Visitors Bureau, and you can too. 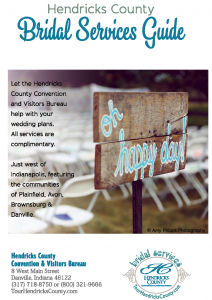 We have people that help brides to do things like block rooms at a Hendricks County hotel for their out-of-town guests, find wedding vendors in the area and more. Best of all, the services are complimentary. I would suggest starting with a Hendricks County Bridal Service Guide that lists all of the ceremony and reception facilities, caterers, wedding rentals, florists, entertainment and more. To request a guide or see how the HCCVB can help, e-mail Kara at Kara@TourhendricksCounty.com. Don’t forget that this day is about you and your future husband! You will get a lot of advice, and I definitely suggest you listen but don’t lose focus on what’s most important to the two of you. What tips would you share with future brides? Feel free to leave your feedback in our comments section below.